Barry L. Shoop became Dean of the Albert Nerken School of Engineering in January 2019 after retiring as a Brigadier General from a 38-year career in the U.S. Army. For the last 25 years, he served in a number of key leadership roles at the U.S. Military Academy at West Point including Director of the Photonics Research Center, Director of the Electrical Engineering Program and most recently as Professor and Head of the Department of Electrical Engineering and Computer Science. In this capacity, he was responsible for an undergraduate academic department with over 79 faculty and staff supporting Accreditation Board of Engineering and Technology (ABET) accredited programs in electrical engineering, computer science, and information technology. The department engages over 2300 students annually and has three affiliated research centers including the Cyber Research Center, Photonics Research Center and the Robotics Research Center. Earlier in his career, he was a satellite communication engineer responsible for the design and installation of a high-capacity, global digital communication network, and also the Chief Technology Officer for a US$4.5B organization addressing the Improvised Explosive Device (IED) challenge worldwide. Dr. Shoop received the B.S. degree from the Pennsylvania State University and Ph.D. from Stanford University, both in electrical engineering. His research interests include optical information processing, neural networks, image processing, disruptive innovations and educational pedagogy. He is a Fellow of the Institute of Electrical and Electronic Engineers (IEEE), the Optical Society of America (OSA) and the International Society for Optical Engineering (SPIE) and a member of Phi Kappa Phi, Eta Kappa Nu, and Sigma Xi. He has served on the Board of Directors of OSA, ABET and IEEE. 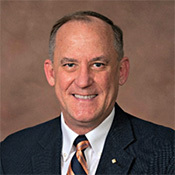 In 2016 Dr. Shoop served as the IEEE President and CEO. In 2008, OSA recognized him with their Robert E. Hopkins Leadership Award and, in 2013, he received both the SPIE Educator Award and the IEEE Haraden Pratt Award. Dr. Shoop holds a patent on photonic analog-to-digital conversion and has authored over 150 archival publications as well as 8 books and book chapters. He is a licensed Professional Engineer in the Commonwealth of Virginia, USA.